Having a big family often puts a financial restraint on our activities. 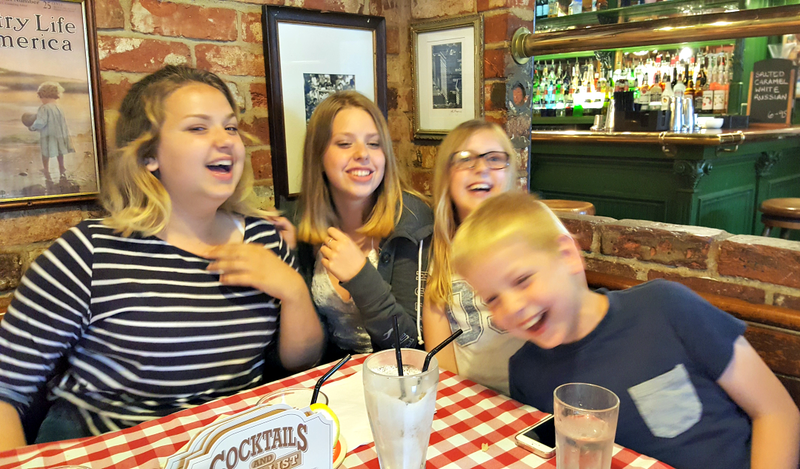 When I had the kids for a week last week, I treated them to a rare family meal out at Back Inn Time. The kids had always wanted to go to Back Inn Time restaurant in Chelmsford. I finally managed to get a table booked for us all and sprung it as a surprise for the kids. After we’d eaten our mains, I tried to get a decent group photo of the kids. They are all at an age now where they tend to be off doing their own thing. Getting them all in one place at the same time is rare. When we do manage it, the air is normally fraught with arguments, hormones and the general itchy feeling that comes along with families sometimes. Any hope of getting what I’d class as a proper family photo went out of the window. Everyone was in a great mood, there was a lot of silliness and despite snapping a dozen or so pictures, not one came out with everyone looking good. We had blurred faces where people had moved, we had one of the four not smiling. We even managed a photo where my son looked alarmingly like a smug Donald Trump. But I got this photo. And I love it. All four of the kids, mid-raucous laugh. It truly captures a very happy moment. What a great photo! A really happy moment. Ahh its a brilliant photo – I just love a blurry photo where everyone is laughing, it really captures the moment so well! Lovely – they all look so happy. Fun family moments like this are to be treasured.